9th April, 2019 History of Hull’s Cemeteries 12. This and my third blog of this week will be a collection of minutes from the Burial Committee archive relating to the first few years of Crematorium at Hedon Road Cemetery, Hull. The picture above is of the date-stone set into the lower wall of the Crematorium (disused since 1961, s.p.b.). It gives the year 1899 so probably commemorated the early part of the building programme rather than its completion, but this could be wrong (as pointed out in yesterday’s blog I have yet to study the minutes covering the building programme). In November 1905 it was minuted that the members of Hull Y.P.C.(?) and Literary Institute had had a debate and had then sent a letter thanking Hull Corporation for establishing a crematorium. 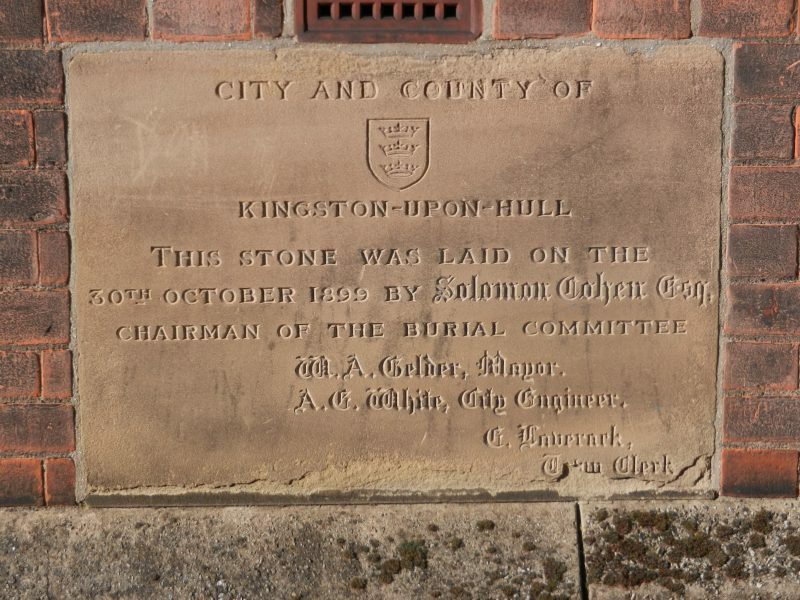 In the spring of the following year it was recorded that a Hull alderman had recently died and been cremated, his remains were to be placed in a suitable receptacle ‘upon the walls of the crematorium chapel’. I have never been in the Crematorium building so have no knowledge of the interior, or how well, or not well, it survives. In 1908 the Burial Committee minuted receipt of a letter from the Scottish Burial Reform and Cremation Society asking for support for their idea that cremated remains could be interred in disused burial grounds (s.p.b.s on Castle Street site). The Committee disagreed. Early in 1907 a statement of accounts shows that the Crematorium was only allocated 1 per-cent of the budget of the parks, cemeteries and recreation grounds funds, although it also was allocated some funding from the ‘City Fund'(?). Two months later a letter of thanks to the Crematorium staff was received from the Earl of Liverpool who then lived at Kirkham Abbey, North Yorkshire re the cremation of his father, he adding that previously he ‘had no idea … that there was a crematorium nearer than Woking’. Woking (Surrey) Crematorium is important in the history of this topic and tomorrow I will start with a reference to it.